Economists and technicians often have to calculate the percentage of. Accountants need to correctly calculate the taxes, the bankers income (interest) on deposits, the engineering of the tolerance parameters. In all such cases it is necessary to consider the interest from some known values. 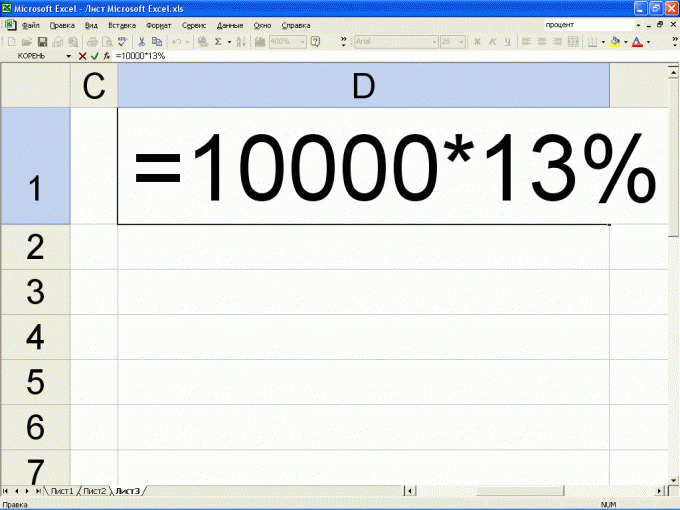 To calculate the percent of the number, need the number to be multiplied by the percentage then divide by 100. For example, if the employee's salary amounted to 30,000 rubles, income tax (13%) of this amount will be: 30000 * 13 / 100 = 3900 rubles. To calculate the percentage of a conventional calculator, perform the following sequence of actions. Enter on the keyboard number % (button%" while pushing is not necessary). Click on any of the signs of arithmetic operations ("+", "-", "x","/", in this case this button is used as the delimiter when you enter numbers). Now type on the calculator the number from which you want to calculate the interest. Click on the "%". On the display of the calculator appears the desired result. Calculating percentages of numbers using a computer. To do this, run the standard Windows calculator. To do this, click start - > Run -> type "calc" -> OK. If the calculator is loaded into "Engineering" form, install it in "Normal" mode ("View" -> "Normal"). Then calculate the percentage of the number is the same as described in the previous paragraph instructions. To calculate the percent of the number in MS Excel, type the following sequence of characters: "=" "number" "*" "percentage" "Enter". So, for example, to calculate 13% of 10000, enter in the desired cell the following formula: =10000*13% and press "Enter". If you did everything correctly, then in the cell instead of the formula will appear as 1,300.